Heat oven to 425°F. Line cookie sheet with cooking parchment paper. Break apart garlic bulb into cloves but leave skins on. In large bowl, toss garlic cloves, corn and tomatoes with 1 tablespoon of olive oil; spread on cookie sheet. Roast 25 to 30 minutes or until vegetables are caramelized around edges a little bit. Remove from oven; set aside to cool. While vegetables are roasting, in 3-quart saucepan, heat remaining tablespoon oil over medium heat. Add shallot and salt; cook until softened and translucent. Stir in evaporated milk and green chiles. Heat to boiling. Add cream cheese, stirring well to combine. In 2 batches, add Cheddar and pepper Jack cheese, stirring well after each addition until combined. Remove from heat. Squeeze cooled cooked garlic from skins into cheese mixture. Fold in roasted corn and tomatoes. Serve queso warm with chips. I used 2% evaporated milk in this recipe with excellent results. It also works wonderfully with whole evaporated milk. Avoid using fresh milk as it will curdle when it boils. To make squeezing the garlic from their skins even easier, snip or trim off just the root end before roasting. To avoid the dreaded double-dip, set out small bowls or ramekins so guests can spoon out personal portions of the queso to dip freely. You can make this dip ahead and refrigerate it until ready to serve. 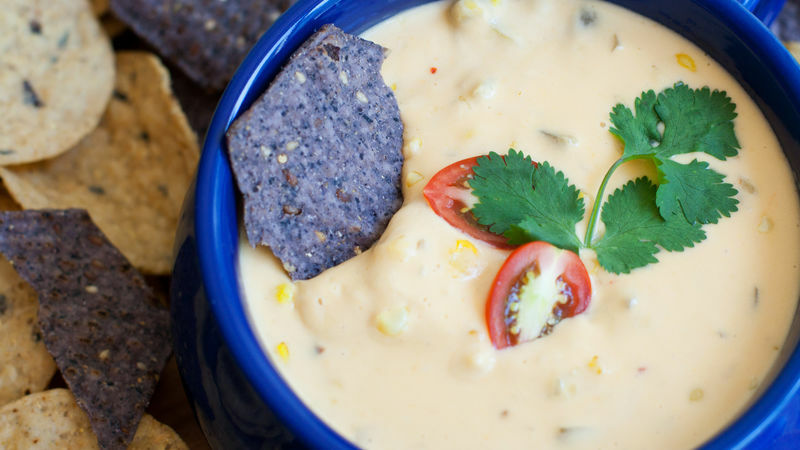 Just heat the queso gently on the stove or in the microwave, stirring often and taking care not to burn.